It's no surprise that one of our Mattress Masterminds works on our Sales Team. 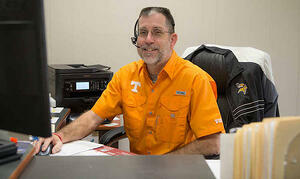 Tim Will has had his hand in a lot of projects, deals, and departments during his 15+ years at American Bedding. When I started in the office over 15 years ago, I handled most of the incoming calls, worked on quotes, processed orders, and resolved shipping issues. We also had a retail residential mattress showroom back then, and I covered walk-in customers, unless I was on the phone talking to a camp director, college housing office, or whomever else. I still do most of those things, except we no longer have a showroom. Additionally, since we now have three full-time salesmen, we employ a couple of folks who screen the incoming calls and handle some of the preliminary work involved with generating a quote. It's a long story, but ultimately it was the Lord. After retiring from the Marine Corps in ’96, I attended a Bible college in Minnesota. I ended up in Athens in 2001 for what I thought would be a 15-year career (maybe 20) teaching elementary grades in a Christian school and enjoying my summers off. I wasn’t too far into my first year of teaching (5th graders, all subjects), when I realized that the Lord had not called me to teach full-time in a Christian school. Still, the Lord was faithful (as He always is) and got me through the year. I started working full-time at American Bedding in mid-May 2003. I had worked here for a couple of months during the summer of 2002—before my short-lived teaching career. When it became apparent that my first year of teaching was going to be my last year, I approached Boyd about coming back to American Bedding. I told him I would work in the plant so that I could learn more about what goes on in production, but I really wanted to get involved in sales at some point. I worked in the plant for four or five months and moved into the office in the fall of 2003. When I have multiple quotes to work on, multiple sales orders to process, multiple shipping issues to resolve, and the phones keep ringing—that can prove to be a wee-bit challenging at times. But praise the Lord, everything always gets done. Being able to get the customer what they need when time is not on our side. But I really have to give all the credit to Delbert, our plant manager, and the production folks, as well as to Randy, our shipping manager, and the whole shipping department. I can't help but to dovetail on Delbert’s comment about seeing the way the Lord has blessed American Bedding over the years—I thank the Lord that I was able to have a little to do with that. The fact that it's family owned and family operated really gives it a family atmosphere, which is a blessing. I remember the first couple of years I was in the office, Boyd’s two youngest, Hali and Kevin, would come in sometimes with their Mom, Jan Reynolds. Jan would be working and they would be in the warehouse making sure the foam had plenty of bounce. Now Hali is working in our accounting department, and Kevin has recently gotten involved in deliveries and installations for those customers close enough for it to be economically feasible. Spending time with my family: my wife Patty of 38+ years, three children, five grandchildren (with a sixth in the works), and two great-grands (one of whom was born on my birthday two years ago on August 2nd). I enjoy running because it gives me time to marvel at God’s creation and thank Him for His many blessings in my life; however, with a busy work schedule and the aforementioned “grands” and “greats,” I don’t make as much time to run as I’d like. One of the best things about American Bedding is that we're plugged in and easily accessible to our customers. Our business is family-owned, and we consider our customers to be an extension of that family. Click on the banner below to contact our sales team today!